PSA: Mortick's Brace was removed from Patch 2.2 and will not drop. When the above tweet from Diablo 3 Associate Game Designer John Yang was published yesterday after patch 2.2 went live in the Americas, legions of barbarians stormed the official forums to vent their anger. What happened? [Arreat's Wail]: Activating Wrath of the Berserker deals 3400% weapon damage as Fire to all enemies within 15 yards. [Insanity]: While active, gain 50% increased damage. [Slaughter]: While active, Critical Hits have a chance to cause an eruption of blood dealing 300% weapon damage to enemies within 15 yards. [Striding Giant]: Reduce all damage taken by 50%. [Thrive on Chaos]: While active, gain 5364 Life per Fury spent. As you can see, this would have made Mortick's Brace hands down the single most powerful legendary in the game and the single most important item for barbarians to excel on the Season 3 leaderboards. So, was the decision to implement this item or legendary power a bad idea in the first place? No, because multi-rune powers on items are now part of the game mechanics (see the Legacy of Raekor set or the Undisputed Champion Mighty Belt). Was the implementation on bracers a bad idea? Yes, because such immense power would belong as 6-piece bonus on a dedicated set. If we know that an item is overpowered or unbalanced in the context of other legendaries/sets, you can be sure that the devs know it, too. I'm therefore confident that John Yang was simply caught in the middle of the second iteration of the new Wrath of the Wastes barbarian set, which is dedicated to the popular Whirlwind skill but felt more like a Rend set during its first iteration. 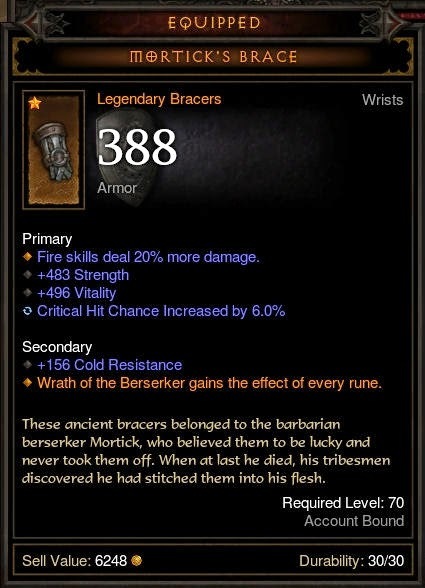 In an effort to add more spice to the set and celebrate a sort of "Classic Whirlwind Barbarian" revival, the bracers were born but balancing both the set and the bracers couldn't be completed because he got the notice that Season 2 ends (way) earlier than originally planned (see my recent Diablo 3 Expansion 2 speculation blog for more about this). If Mortick's Brace would have gone live in its current iteration, the barbarians for sure would have wrecked the leaderboards and party play of Season 3 in almost no time, so the dev team really had to pull the plug. It's unfortunate that this came too late, because a lot of players had already spent thousands of Blood Shards to gamble these bracers after patch 2.2 went live, but the decison was absolutely correct.